Purina proudly calls St. Louis, Missouri home, and takes supporting their communities very seriously. Since many St. Louis youth face academic challenges tied to poverty, Purina set out to find a program to reach at-risk kids that linked social and emotional learning with their core mission of providing supplies to people who love their pets. They searched for seven years, but no program resonated until they found the Mutt-i-grees Curriculum. “At Purina our goal is to always bring people and pets together—we’re better together,” says Gina Breadon, Humane Education and Youth Employment and Development Project Manager, Purina Community Affairs. The initial goal was to reach as many at-risk kids as possible with the Mutt-i-grees Curriculum by launching the program simultaneously in many schools, libraries and shelters. 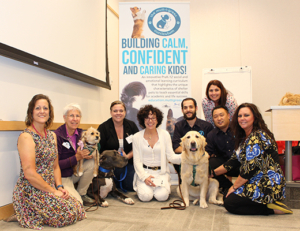 Purina invited the Mutt-i-grees team to St. Louis to train community leaders in implementing the Curriculum, always bringing along shelter dogs to connect with kids as only dogs can. “Purina has given us a huge platform to introduce the Mutt-i-grees Curriculum to a tremendous number of diverse organizations in St. Louis by sponsoring one-day training programs. They truly want to do good and use their resources to help struggling youth in their community,” says Jayne Vitale, director of Mutt-i-grees Outreach and Youth Development Programs. Initially launched in the summer of 2016 in 20 organizations, the Mutt-i-grees Curriculum reached more than 4,500 students in the first year. In 2017, it expanded to include 60 organizations, reaching more than 15,000 youth. Another key goal of Purina was to improve the economic outlook for youth in poverty. Hence, the Mutt-i-grees Curriculum was established at a teen detention center, providing opportunities for youth to learn 21st century skills such as empathy and collaboration, and opening doors to careers many disadvantaged youth never thought possible. Through participation in service-learning opportunities, teens gain real-world experience working with animals while receiving adult mentoring to hone their job skills. Great jobs working at Purina directly, or in the field of animal welfare, are now within reach for many of these teens. Purina has big plans to continue growing the Mutt-i-grees Curriculum in St. Louis. Plans for 2018 include implementing the Curriculum in more schools, libraries, and another teen detention center, as well as providing professional development trainings for educators. Purina will continue to connect at-risk teens with prospective employers through service-learning opportunities, and nurture teens who volunteer at local animal shelters. Purina also hopes to launch the Mutt-i-grees Curriculum in other communities across the country where they have factories. We thank our friends at Purina for sponsoring this exciting partnership with the Mutt-i-grees Curriculum to reach so many kids and families in St. Louis and other communities. We look forward to deepening the bonds between communities, kids, and pets through our partnership with Purina and will report our progress. Stay tuned!